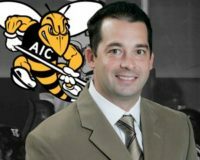 New head coach Eric Lang is looking to build a juggernaut at his alma mater American International (AIC). And, he knows only one way to do it, the way he learned from Brian Riley. Riley is Army’s head coach–the place Lang spent the past four seasons as an assistant. I first wrote this quick blog post about Lang’s dynasty over on my James Alexander Michie WordPress site, if you’re interested in following that blog.